Yes, hello, it’s me! Poking my head out from my bachelor thesis and engaging with you guys! I’m making progress! I’ve also finished a new interesting book, so keep on reading! Like I said when I read Moxie, I’m not very familiar with feminism. I’m curious about it, but there are so many aspects I don’t quite know where to begin. It’s Happening Now is both for beginners and more advanced feminists in my opinion. I wasn’t always able to follow every terminology that was used in some of the stories, but that was ok. I got the general picture of it all. Some of the stories had very familiar concepts to them, like the one story about Spice Girls. I really liked that because I knew what this was about and the way the author wrote made me able to see Spice Girls in a light I’ve never seen them before. There were some familiar names among the authors in this book. Among them was Maria Kjos Fonn. She has written Kinderwhore which I reviewed before Christmas. Ida Jackson was another familiar name. I’ve read and reviewed her book called Grandpa, Hitler and I. Åsne Seierstad is also among the contributing authors and I have read her book The Bookseller of Kabul, but that’s many years ago. My favourite story in It’s Happening Now was definitely the one written by Sofia Nesrine Srour. She writes about how it is to grow up and being uncomfortable with your body and how negative social focus only makes things worse. She is Norwegian-Lebanese and Muslim. I found it so enriching to read about feminism from such a different perspective and I loved how she just put the facts out there. It’s refreshing with these voices who just speak out. Her story brought up topics I either hadn’t considered as much or not at all, and this is why I read these books; to get a different perspective and learn something new. She’s a part of the group known as The Shameless Girls and together this group has put social control in minority cultures on the agenda. It’s Happening Now is one of those important books that should be read. It gives new perspectives on #Metoo and some backstory which is great. I learned a lot of new things while reading this book and it was a good reading experience! The stories are short and well written by people who know what they’re talking about, and that’s refreshing. I’ve asked the author if the book will be published in English, which it won’t. I’m sorry my English speaking friends! 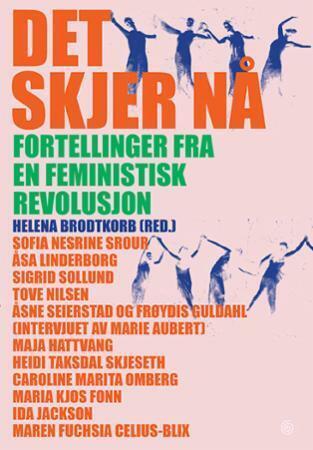 I encourage all of my Norwegian readers to give this a go whether you know a lot about feminism or not. I’ve become more curious and I will do a bit more research after May 15!